The Guardian Series indoor/outdoor Air Conditioners Maintain NEMA 12 & 3R Ratings. All units are designed specifically for NEMA 4 enclosure applications that require washdown or are subject to outdoor storm conditions. All Guardian models have a NEMA 4 Rating. With Epoxy-coated condenser coils and tubing, the closed-loop cooling system of the Guardian Series offers added security by providing an operating environment safe from harsh ambient conditions. 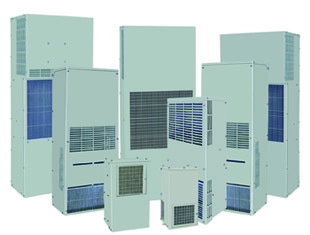 The Guardian Series consists of units with heights from 15 to 60 inches, offering 1,000 to 26,000 BTU/H ratings. In addition to the list of standard features, these Guardian Series Air Conditioners are also available with a wide range of accessories and options, including compressor short cycle protector, temperature alarm and heater kit. The features engineered into the Guardian Series make them a tamper-resistant choice for external applications. With all models UL/CUL Listed, the Guardian Series is an excellent choice for telecommunications, food and beverage and other challenging applications. ANSI61 Gray. Consult Kooltronic for further information concerning unit color. A thermostatic temperature sensor installed in the refrigerant liquid line, controlling the condenser fan. All Guardian Series units Maintain NEMA 12 & 3R Ratings. All units are fully gasketed for tight, leakproof installation, in compliance with the NEMA Type 4 Enclosure Ratings.